I love the artwork that Etsy seller TreasuresByUs does. 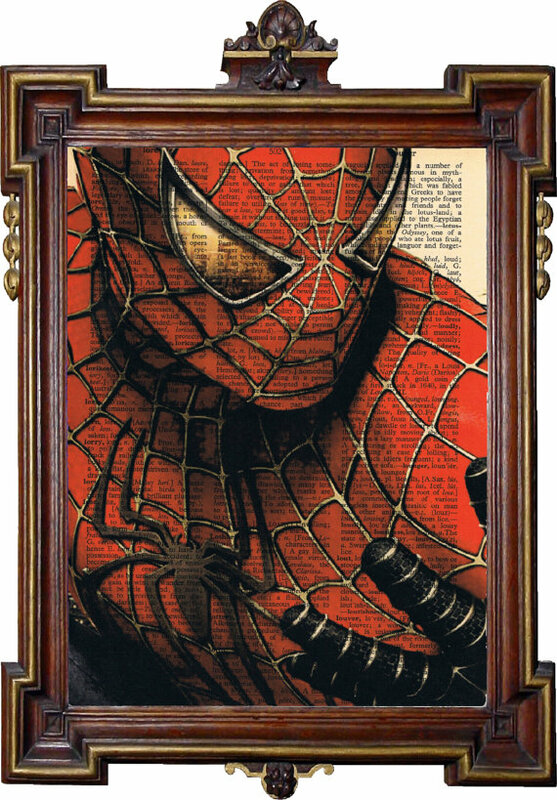 Check out the SPIDER-MAN work and read on below if you're interested in owning an original piece of art. They run $6.50 plus shipping. This is a print on a golden color page of an old Dictionary. The image is printed directly on the recycled antique paper. The result is a unique and absolutely beautiful print suitable for framing. The page is approximately 7.5 x 10'' (19 x 25,5 cm) in size. You will get the exact image shown in the listing, but the book page it is printed on will be different but similar because its from the same book . You will receive just the print. The frame is not included, sorry. All prints are shipped flat in plastic mailers and are protected in plastic sleeve and between cardboard.